This book brings into view the most enduring and distinctive philosophical current in South African history—one often obscured or patronized as Afrikaner liberalism. It traces this current of thought from nineteenth-century disputes over Dutch liberal theology through Stellenbosch existentialism to the prison writings of Breyten Breytenbach, and examines related themes in the work of Olive Schreiner, M. K. Gandhi, and Richard Turner. At the core of this tradition is a defence of free speech in its classical sense, as a virtue necessary for a good society, rather than in its modern liberal sense as an individual right. Out of this defence of free speech, conducted in the face of charges of heresy, treason, and immorality, a range of philosophical conceptions developed—of the self constituted in dialogue with others, of freedom as transcendence of the given, and of a dialectical movement of consciousness as it is educated through debate and action. This study shows the Socratic commitment to "following the argument where it leads," sustained and developed in the storm and stress of a peculiar modernity. 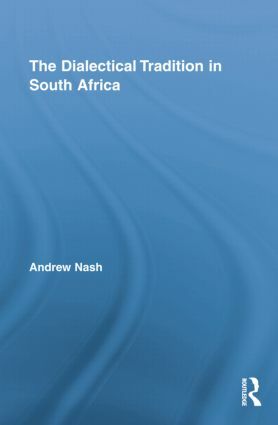 Andrew Nash is associate professor of Political Studies at the University of Cape Town, South Africa.